How good is Repsol Honda rider Marc Marquez? He’s so freaking good that he took pole position at Circuit of the Americas on a backup bike, which he had to run to with just three minutes left in qualifying and then used to destroy the circuit’s motorcycle lap record. After experiencing trouble with his primary bike on the way up to turn 1, the 22-year-old two-time MotoGP champ had to leap over the wall and run down the pit lane to grab his backup bike. 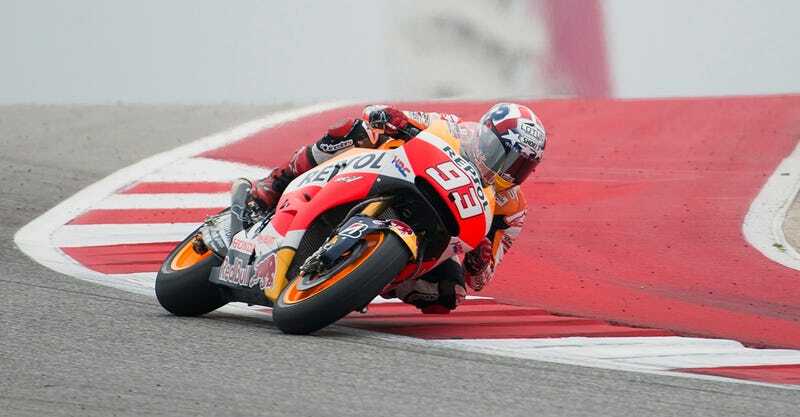 He then set a lap time of 2:02.135, the fastest anyone has ever gone around COTA on a motorcycle. It trumps the previous record of 2:02.773 — which was also set by Marquez at last year’s race. Marc Marquez is basically God. Just on a motorcycle. Ducati's Andrea Dovizioso placed second, and MoviStar Yamaha's Jorge Lorenzo and Valentino Rossi will start third and fourth. The race, which could be a rainy one, is set to start today at 3 p.m. EST.